This statistic shows the number of Facebook users in India from 2015 to 2023. 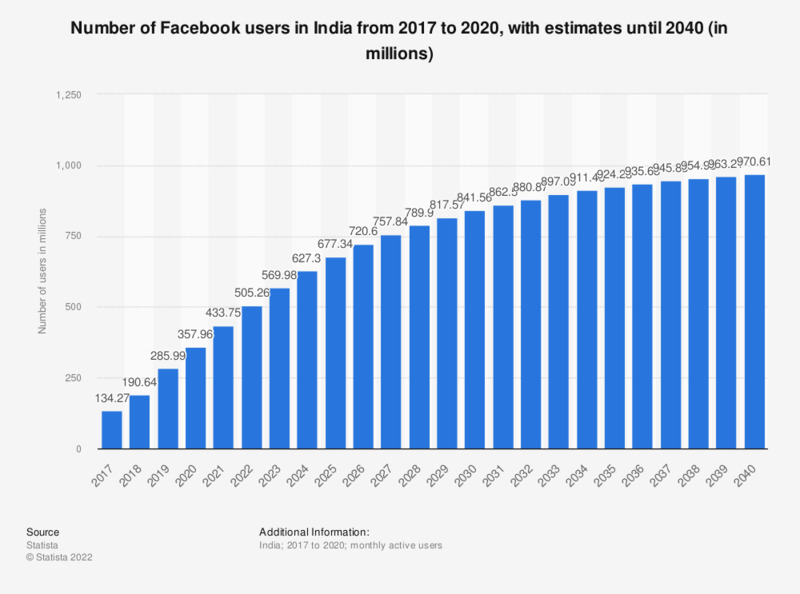 In 2023, the number of Facebook users in India is expected to reach 444.2 million, up from 281 million in 2018. Facebook, headquartered in Menlo Park, California, is by far the leading social network in the world. Not only has the company been leading the market in number of active users – more than 1.7 billion active users as of September 2016 – but Facebook also owns three of the most popular social networks in the world, WhatApp, Facebook Messenger and Instagram. As of September 2016, WhatApp and Facebook Messenger had one billion active users each, while photo-sharing Instagram’s active users added up to a total of 500 million active users during the measured period. Social networking, one of the main online activities, shows healthy projections for the coming years, as the number of social network users worldwide is forecast to grow from 2.14 billion in 2015 to nearly three billion in 2020. The number of social network users in India stood at around 216.5 million in 2016, and is forecast to amount to more than 336 million by 2020. From this figure, Facebook accounts for the majority of these users, as the social network is the most popular social network the country. There were about 195 million Facebook users in India as of May 2016, against about 191 million in the U.S. and 90 million in Brazil. These figures place India as the country with the largest Facebook user base in the world. The number of Facebook users in India is forecast to continue to grow in the coming years, and add up to nearly 320 million by 2021. In line with this growth in users, Facebook penetration rate in India is expected to jump from almost 15 percent in 2016 to around 23 percent in 2021.